UPDATE: Added the New Download Link of MIUI 9.5.17.0 OEIMIFA Global Stable Android 8.1 update in Download Section. MIUI V9.5.17.0.OEIMIFA Android 8.1 OREO Official Rom is now available for the Redmi Note 5 Pro users. This the latest Official global Stable rom and not the beta or leaked ROM. Today Xiaomi released this new Android 8.1 OREO rom for the Redmi Note 5 Pro users. The OTA update of this new 8.1 OREO MIUI V9.5.6.0.OEIMIFA has received for many users and some of them are still waiting for it. If you are one of them and didn’t receive the OTA update of MIUI 9 Android 8.1 OREO on your phone. Then Don’t worry here is the complete guide which you can use on your phone and install the latest Global Stable version of Android 8.1 OREO on your Redmi Note 5 pro. This is the Official Stable ROM from Xiaomi and released officially for the Redmi Note 5 Pro users. This new ROM comes with lots of new features like FullScreen Mode, New gestures, Dual 4G Mode (Dual Volte). The rom is stable and the battery performance of the phone is much better than the previous ROMS. 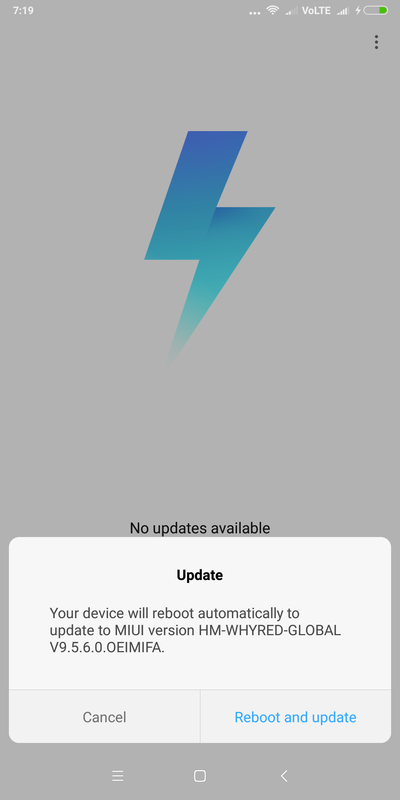 To install this update on your phone, no need to root the Redmi Note 5 Pro or install TWRP recovery. All you have to download the official ZIP file of the 8.1 OREO MIUI V9.5.6.0.OEIMIFA on your phone and you are ready to go. Below is the whole guide to instill the same on your phone. Warning: Technobuzz.net is not responsible for any damage that might happen to your phone during this process. So let’s get started and download MIUI V9.5.6.0.OEIMIFA Global Stable On Redmi Note 5 Pro. Make sure that your phone has at least 50-60% charged to prevent the accidental shutdown during the flashing process. So let’s get started and download Redmi Note 5 Pro Android 8.1 OREO ROM. 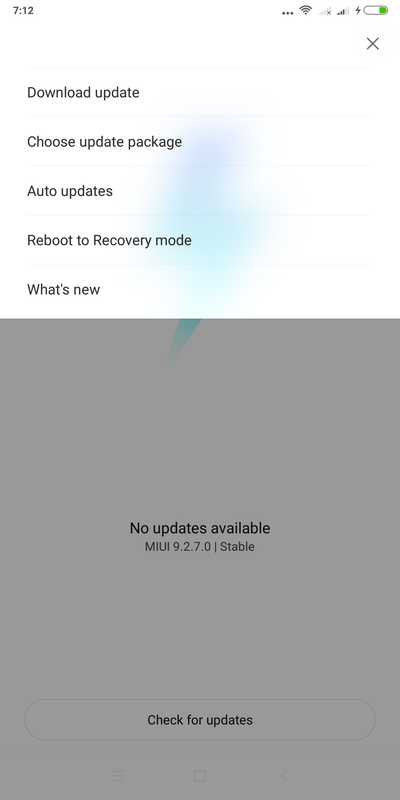 As we mentioned earlier that this is Global Stable version of MIUI 9 Recovery ROM and not the fastboot ROM and you have to flash this ROM on your phone with the help of your updater app. 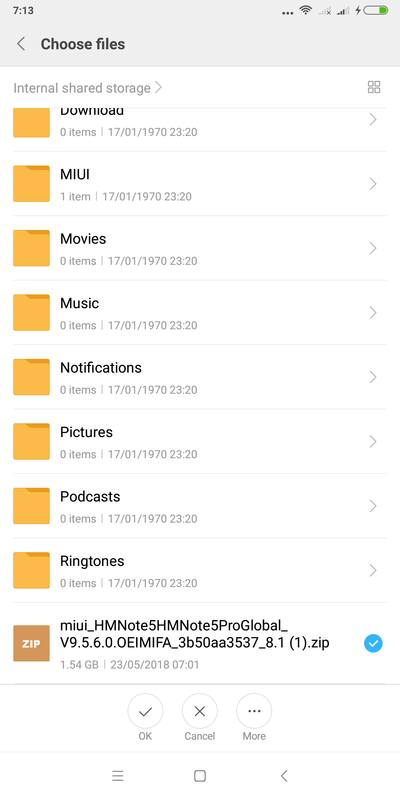 Below is the zip file of the Android 8.1 OREO ROM [MIUI V9.5.17.0.OEIMIFA]. Download and save the Zip file on your phone’s internal memory and follow the guide to install the same on your Redmi Note 5 Pro. 1. Save the Redmi Note 5 Pro Android 8.1 OREO ROM [MIUI V9.5.6.0.OEIMIFA] zip file on your phone’s internal memory and remember the location of your file. Make sure the ZIP file is in the root directory of your phone, not in the folder. 2. Now time to flash the zip file on your phone. Go to Settings of your phone > About Phone > System Update. From here click the ‘…’ icon at the top-right corner, and “Choose Update package”. See the screenshot below. 3. Now the file manager will open on your device, from here select the ROM zip file that you saved on your phone. 5. Once completed, you will see the option to update your phone. Hit the reboot button to apply this MIUI 9 Android 8.1 OREO update on your Redmi note 5 Pro. Thats’t it. Now your Redmi Note 5 Pro is running on the latest Official MIUI 9 Android 8.1 OREO ROM. Post achi tarah padte nahin ho aur gali dete ho,… uppare dekho 3 link hai..
To inn teeno me se konsi link download kru..?? Thanks author for the apt guidance. It was helpful..
aap pe depend kart ahai kaise karoge. Hello sir , if i update to this rom then will my phone is formatted or not?? ???? ?, ???? ??? ???? ?? (1) Before Update ?????? ?? Unlocked ???? ?????? (2) ??? ?? Miui ?? Ota update Direct Miui ?? ????? ??????? 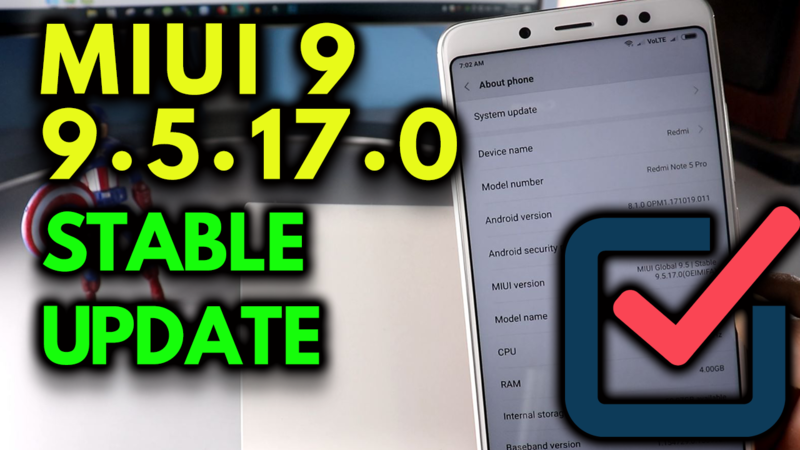 What if mi launches miui 10 update for regular customer do we get same update? I have done Manually Update MIUI 9.5.13.0 based orio through Updater appps So Can I Get Future Uppdate Through OTA? Global Version or Indian version? After updating, my Redmi Note 5 Pro weren’t playing Ringtone’s for the incoming calls on both the SIMs! Is update will come after installing 9.5.13.0 . This update . Bhai mera note 5 pro me 9.2.13.0 he Apne above question me reply diye the ki 9.5.14.0 wala sahi he karke to future updates like miui official update phone me to ayega na pls tell me aur ek question ye update to Bina twrp ke hota na ????? Is it doesn’t void my warranty ??? You will get the OTA updates, This is the official Link and Update. 100% safe and this will not void the warranty. Bhai 9.5.14.0 me volume related bug hai. Earphones/headphones use krte time notification tone, ringtone, lock/unlock sounds and even in games me volume boht low gai jab ki media volume high hai mere mobile me. The update shows ROM is in beta testing, make sure you have signed in with a beta authorised xiomi account. Thanks a ton buddy. Updated to the latest one without any trouble. Keep up the good work. bangladesh se nehi hoga kya?? 90 mbOta file download was neccasary..? If I update miui 9.5.13 from your website on my redmi note 5 pro. Will I get the official update of miui on my phone? Will I loss my warranty? I’m in version 9.5.13, Can I just download ota of 9.5.14 ??? Aisa kyu likha hua aa rha h? That’s nice .. thank you sir it’s working . Mere phone 9.2.4.0 hai aur mujhe 9.2.13.0 update notification mil rehta hai. To kya Mai directly 9.2.14.0 update ker Sakta hu? Pls advise. 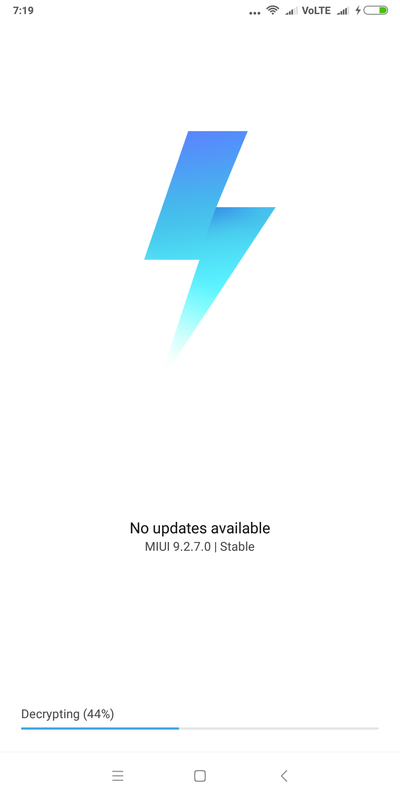 Sir please share miui 9.5.17.0 OTA update link as well separately, as my phone is already running on miui 9.5.14.0. Es se data erase to nhi hoga????????? bhai downloaded rom select kene pe likhta hai unofficial rom cant be installed … ye kaise thik hoga.. har baar download krta hun rom aur delete krna parta hai?? Bhai aapke link se miui 10 ka zip file download krne pr 97% hone ke bad bar bar Feil kyo ho ja raha h…?? ?